A fall-inspired comfort food pasta dinner. Perfect for a meatless meal or vegetarian side dish. 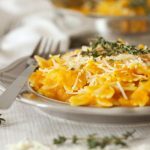 The vegan butternut squash pasta sauce is rich and creamy, but also low in fat and calories, so it's healthy! 340 g whole grain pasta cooked in salted water according to package directions (reserve 1 cup of the pasta water). I like to use Farfalle (bow-tie pasta) for this recipe, but Penne also works well. Prepare your butternut squash for cooking by cutting it in half from top to bottom, peeling each half, scraping out the seeds and all the stringy bits, and cutting it into 1/2-inch chunks. TIP: Butternut squash can be difficult to peel and chop so a great trick is to stick it in the microwave whole for 2-3 minutes on high before trying to peel it. Microwaving it slightly will cook the flesh just under the skin making it much easier to peel and chop. Heat a large skillet over medium heat. Add the olive oil, then the minced garlic, chili flakes and the fresh thyme leaves (use your fingers to push/remove them from the stem). Saute the garlic, chili flakes and thyme for about one minute before adding the chunks of squash. Stir until the squash is coated in the garlic mixture and then add the vegetable stock and cover and let it simmer for about 25 minutes, checking on it every 5 minutes or so and giving it a good stir. During this time, cook your pasta according to the package directions, being sure to reserve about 1 cup of the pasta water after the pasta is cooked and drained. After about 25 minutes the squash pieces should fall apart when you try to pierce them with a fork – this is the texture you need for this sauce. Stir the mixture well until the squash pieces fall apart completely and the mixture becomes somewhat smooth. Add the cooked pasta to the skillet with the squash sauce and add the pasta water about 1/4 cup at a time until the sauce becomes totally smooth and not at all thick and sticky. You may not need to add all the pasta water you’ve reserved, so be sure to stop adding water when you’ve achieved the texture you desire.